Walk out the door and down a grassy path to one of the most spectacular beaches anywhere in the British Isles and just take in the shear magnitude of the wonderful Bamburgh Castle, probably the finest castle in England. It is perched on a basalt outcrop on the very edge of the North Sea commanding stunning views of the Farne Islands and Holy Island. If you are staying in the spring or summer; this starts on boats from Seahouses and there are so many different operators, trip times and boats available that one can pick and choose whether to land or not, how long a trip to go on, etc. Be sure to prepare to get splashed on occasion. But the sight of hundreds of grey seals, puffins, guillemots, terns and a myriad of other sea birds is exceptional. The views back to land are also stunning with Lindisfarne Castle to the north, Dunstanburgh to the south and Bamburgh in the middle with the backdrop of the Cheviot Hills in the distance, a memorable experience. You can walk from either Craster or from Newton by the Sea. The Ship Inn at Newton is a great little pub with simple lunches and more elaborate dinners. If one starts at Craster, there is the Jolly Fisherman, a pub with lovely crab sandwiches. Opposite is the famous Robsons Craster Kippers smokery where one can buy freshly smoked kippers at source. Tthe gardens are a great hit with children with water features that often result in happy but wet children! The garden is more a pleasure ground than a garden in the conventional sense in parts but the whole site is a remarkable achievement in ingenuity and design. The castle is a Norman stronghold from the outside and an elaborate palace internally and is full of remarkable treasures amassed over 700 years of ownership by the same family, the Dukes of Northumberland. When in Alnwick or as a trip on its own that is worth doing anyway, you must visit Barter Books situated in the old Victorian Railway station in the centre of Alnwick. This is a remarkable place by any standards with a wonderful selection of books on every topic and up to any value! On my last visit, their most expensive book was £18,000! Of course there are thousands of books at £3 or less. What is so extraordinary about Barter Books beyond the books is the attention to detail that has been lavished on this remarkable building with old waiting rooms turned into reading rooms with fires burning. A small café is a recent addition and there are commission are works throughout the building that are tied to the history of the building as a railway station. If you are at all interested in books I urge that you visit this special place. This island is accessible across a causeway that is covered by the tides twice a day. Please check the tide table that you will find in the cottage as it is essential that one does not stray out of the fixed (and changing times) as many visitors to the island have found to their peril, inevitably through their own stupidity. The castle is well worth a visit especially for those interested in the work of Lutyens, who remodelled the building in 1904. It looks down on a small garden by Gertrude Jekyll set in a stone enclosure to the north of the castle, but it is the unusual nature of the island, its role in the history of Christianity in the north through St Cuthbert and St Aidan. This National trust property is set on the outskirts of Rothbury and coincidentally also previously in the ownership of the Armstrong family who own Bamburgh Castle to this day. Cragside was designed by Norman Shaw and built from scratch is a series of stages; it is highly stylised and full of amazing treasures from the Victorian era. Lord Armstrong became wealthy through developments such as the first hydraulic crane and later in the manufacture of armaments that were sold worldwide. Cragside was the first house in the world to be lit by electricity using incandescent bulbs developed by a friend of Armstrong, Sir Joseph Swann. Power was provided by a hydraulic system driven by a series of lakes set above the house and for those of a technical mindset, The Power Trail laid through the estate is a fascinating tour showing the massive ingenuity of this most amazing entrepreneur. A visit to this Georgian mansion house run by the National Trust, and set in wonderful gardens, is also a must. 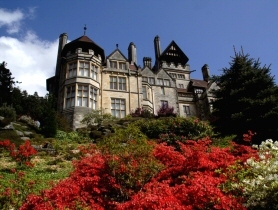 Although it is probably 45 minutes from Bamburgh, it is well worth the trip as it is a dramatic contrast the rugged setting of Cragside and the house itself has a wonderful dolls house collection and a hall decorated with world famous Pre-Raphaelite wall panels. Start at Berwick on Tweed, a town that is now set in England but was previously in Scotland. From there, one can journey inland and take in Kelso with Floors Castle and Mellerstain House, both worth a visit in themselves. If time is available, Melrose with its wonderful Abbey and nearby Abbotsford, previously home to Sir Walter Scott, are also highly recommended. This shop in Seahouses, set in back lanes behind the harbour, is a great place to buy fresh fish of all sorts; buy something and bring it back and barbecue it on the terrace at Pepperclose and enjoy the best of produce in the comfort of the cottage; what could be better! When in Seahouses visit the Ship Inn, a wonderful pub set above the harbour; this is a treasure trove of memorabilia from the bygone days of the fishing industry. These have been donated by the fishermen, who for centuries have used the Ship Inn to relax after the hardships of their days at sea. These are just ten suggestions of things you might try; some will not appeal and there are masses of other things to do as will be evident from the leaflets in the information box in the cottage. Guests are also asked to write in the White Book detailing their experiences of pubs and restaurants in the area for the benefit of others that follow. Please do consider making an entry.